Here are 26 healthy dorm room recipes you can cook at college. You just need a fridge/freezer, microwave, toaster, and blender! So I have some exciting news…I’m going back to school! Every year on the first day of school, my mom would force us to hold a “1st Day of School” sign and take a photo. And I thought I was done with those photos, but as it turns out, I’m not. In a few weeks I’ll be thoughtfully packing my backpack and spending far too much time planning an outfit for the first day of my master’s program in nutrition and health at Wageningen University, a really great food-focused university here in the Netherlands. I’m the kind of person who easily worries. Which means if I allow myself to think about the 4 hour commute I’ll make each day, or whether I’ll be able to mesh with the Dutch style of teaching, or that I won’t be able to spend half the day in my pajamas anymore, or that I won’t have time to cook decent healthy meals, I’ll just turn into a huge worry wart. Which I realize is not an effective way of dealing with worry. But what is a good way of dealing with worry? A bit of planning! Whether it’s a little bit of self-talk to boost your confidence, back-to-school shopping to get you all ready, or planning out some recipes to keep you fed and fueled, a little planning does a lot to reduce stress. 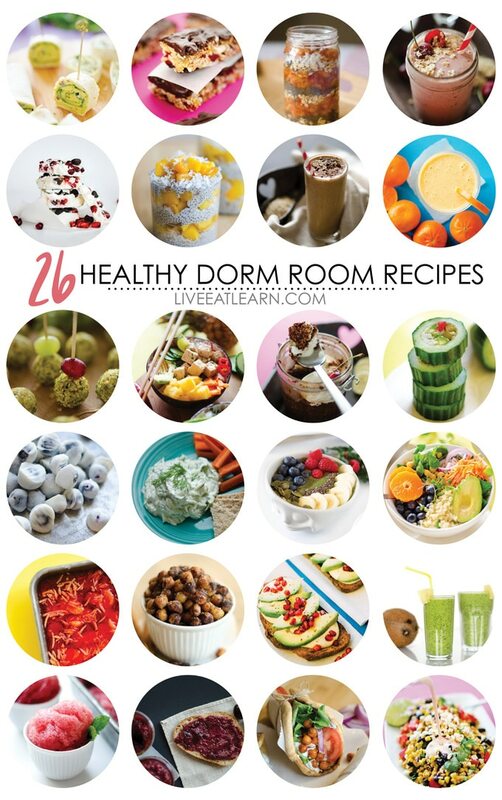 In the spirit of healthy stress-reduction during back-to-school season, today I’m partnering with Amazon Prime Student to share with you 26 healthy dorm room recipes you can make at school. Amazon Prime Student makes everything from grocery shopping to back-to-school shopping stress-free, so whether you yourself are headed back to school this fall, or if you have a child going back to school, I’d highly recommend signing up (you get free two-day shipping, thousands of movies and TV shows, exclusive college deals, and when you sign up, there is no cost for the first six months, courtesy of Sprint!) I had Amazon Prime Student all throughout my college years, and at just $49 a year—half the price of a regular Amazon Prime membership—I was able to easily get all my textbooks, supplies, dry food goods (and…last minute gifts). 1. Basic Overnight Oats: You just need dry oats, milk, and fruit to whip up this ultra-quick breakfast. 2. Cherry Oat Smoothie: This smoothie has everything you need to keep your belly full and brain focused. And the best part? It tastes just like cherry pie! 3. Wake Me Up Coffee Smoothie: Packed with whole grains, fruit, and coffee, this smoothie is breakfast in a glass. 4. Healthy Orange Dreamsicle Smoothie: This smoothie tastes sort of like sunshine and orange creamsicle popsicles. 5. Mocha Overnight Oats: This recipe take your basic overnight oats and adds caffeine! You 8 am class doesn’t stand a chance against you. 6. Tropikale Smoothie: A serving of veggies taken care of on the walk to class? Don’t mind if we do. 7. Kale Smoothie Bowl: For the morning where you have time to sit and enjoy your smoothie, why not eat i with a spoon? 8. Cherry Berry Chia Jam: Keep a jar of homemade strawberry chia seed jam in your fridge for a healthy toast topper. 9. Avocado Pomegranate Toast: Or top your toast with this savory & sour combo of avocado, mozzarella, and pomegranate. 10. Mexican Street Corn Salad: This is a healthy take on Mexican elote. Perfect for bringing to get-together with tortilla chips, or as a tupperware lunch. Just replace the ears of corn with 2 cans of corn, and skip the sautéing! 11. Cucumber Sushi Rolls: Hollow out a cucumber and stuff it with yums! 12. Vegetarian Pineapple Poke Bowls: A refreshing, meatless take on the popular Hawaiian dish, Poke Bowls. 13. Bean Salad: Another great one for taking along to potlucks or for eating with salads/chips/everything. 14. Chickpea Gyros: You can make this scrumptious sandwich by microwaving the chickpeas. Just nix the oil and cut all the spices in half. Microwave on a paper towel for 5 to 10 minutes, or until the chickpeas or slightly cracked and a bit chewy. 15. 15 Minutes Buddha Bowls: These bowls pack a real health punch, with fresh fruits, veggies, and bulgur (which you can sub for quinoa or brown rice). 16. Roasted Chickpea Stuffed Avocado: Low carb and way delicious, these stuffed avocados are creamy spicy, and super simple (but they’ll be sure to impress everyone on your floor!) Use the same microwave directions as in the chickpea gyros above. 17. Avocado Pesto Pinwheels: Layer some pesto, cream cheese, spinach, onion, and avocado on a tortilla, roll it up, and slice. 18. Chocolate Dipped Chewy Granola Bars: Granola bars are super simple to make yourself, and they’re perfect for throwing in you backpack as a snack. Just use your microwave to melt the chocolate and heat the honey. 19. Frozen Greek Yogurt Bark: If you were like me, stuck in an non-airconditioned dorm in college, you’re going to love this frozen Grek yogurt bark. 20. Tropical Chia Parfait: Chia seeds + coconut milk = a really tasty pudding. Layer it with mango and you have a tropically delicious dessert or snack. 21. Crunchy Goat Cheese Wrapped Grap Balls: These goat cheese wrapped grape balls are rolled in crushed pistachios, making them a great study snack. 22. Watermelon Granitas: Another simple frozen treat for hot summer days in the dorm. 23. Frozen Blueberry Bites: Dip blueberries in yogurt and freeze. It’s that simple. 24. Tzatziki: I love having tzatziki around for dipping veggies or for putting on salads and sandwiches. 25. Quick Carrot Jello: For when your sweet tooth is calling but you’re trying to be healthy. 26. Microwave Roasted Chickpeas: This is a crunchy and addictive snack that you can actually cook in the microwave. Microwave on a paper towel for 5 to 10 minutes, or until the chickpeas or slightly cracked and a bit chewy. Thanks again to Amazon Prime for sponsoring this post. I was selected for this opportunity as a member of Clever Girls and the content and opinions expressed here are all my own. What an amazing collection of recipes.I am sure you will have lots of friends at Uni if you present these awesome foods. There’s nothing about this roundup I don’t like! Pinning this for later! What a great healthy round-up! Wish I knew in college what I know now 😉 I’m also addicted to Amazon Prime and love that grocery items are available, too! Looks good! And have great fun at school. Are the lessons in Dutch? Thanks, Wilko! The lessons are in English actually! Thank goodness because my level of Dutch is still at about the level of a 5 year old.